In the late 18th and early 19th centuries the towns of Manchester and Salford were fast developing into the world’s first industrial metropolis. Mass migration of workers especially from Ireland along with the gradual easing of the Penal Laws which had outlawed the practice of the Catholic faith after the Reformation, saw a massive increase in the number of Catholics. Between 1777 and 1837 the number of Catholics in Manchester grew from barely 20 to over 60,000. During Penal Times local Catholic families known as ‘Recusants’ helped to preserve the faith by maintaining secret chapels at Ordsall Hall, Trafford Hall, Barlow Hall, and Wardley Hall. In the 18th century various garrets around the centre of Manchester were used as clandestine Mass centres, served by roving missionary priests. The Catholic Relief Acts of 1778 and 1791 brought some liberty to practice the faith but it was the Emancipation Act of 1829 that lifted the final restrictions on Catholics including those governing the construction of churches. By the mid 1830s there just four chapels in Manchester to serve this vast and growing number of Catholics however in 1835 the pressing need for more churches was made more acute by the collapse of the roof of St Mary’s, Mulberry Street. The decision was made to rebuild St Mary’s and also construct a large church close to the centre of Manchester to help meet the need of the growing Catholic population. In 1840 a site at Hunts Bank near Chetham’s School was purchased but it proved unsuitable when the building of a new railway line at what is now Victoria Station was proposed. The site was sold and a new plot at White Cross Bank (present day Chapel Street) in Salford was acquired. The new site was undeveloped land but was adjacent to a recently established Catholic school with its own chapel, only recently completed in 1843. 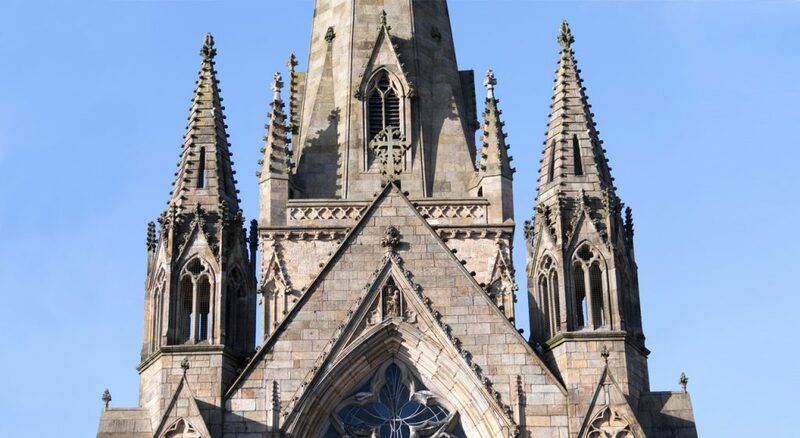 On Whit Thursday, 1844, Bishop James Sharples, Coadjutor Bishop of the Lancashire Vicariate, laid the foundation stone of the new church before approximately 6,000 people. 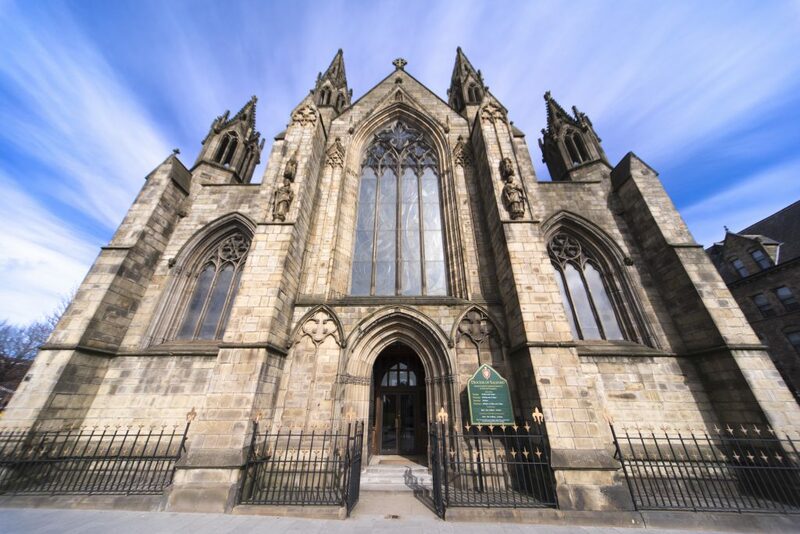 Four years later on 9th August 1848, the Church of St John the Evangelist was opened. The architect was Matthew Ellison Hadfield (1812–1885) of Weightman and Hadfield based in Sheffield, and the construction work was undertaken by Benjamin Hollins of Manchester. Hadfield’s design for St. John’s, the first cruciform Catholic church to be built in England since the Reformation, was closely modelled on a number of noted medieval churches. 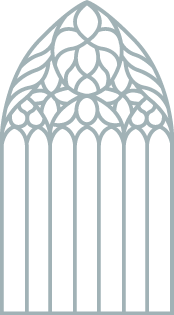 The “west” (actually south) front and nave are based on those of Howden Minster; the choir and sanctuary are closely modelled on Selby Abbey; the tower and spire are copied from the parish church of St Mary Magdalene in Newark-on-Trent, Nottinghamshire; the groined vaulted ceiling of the choir was inspired by that in the church of St Jacques in Liege, Belgium; and the statuary in niches on the columns of the choir are in the are in the manner of those of the Apostles in Cologne Cathedral. 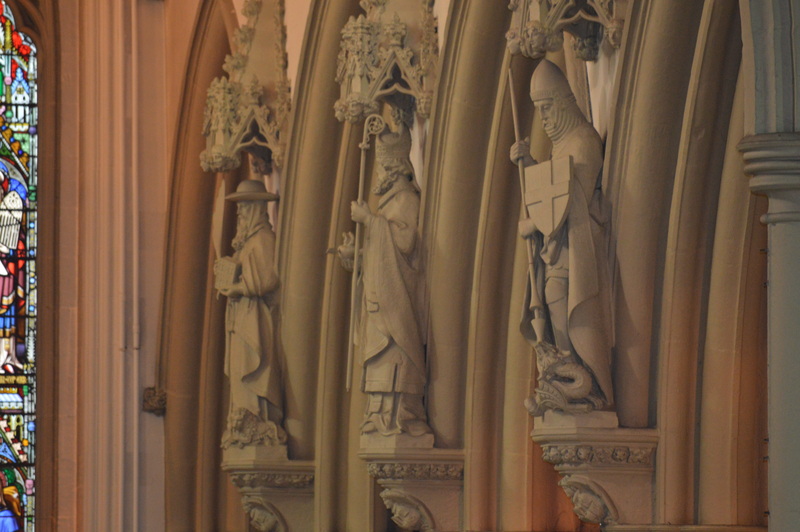 In 1850 the Catholic Hierarchy of England & Wales was restored and the Diocese of Salford was formed and on 25th July 1851, Rev. William Turner was consecrated first Bishop of Salford. After the formation of the Diocese further works were undertaken at St John’s to further embellish the church in a manner befitting its newly granted status as a cathedral. 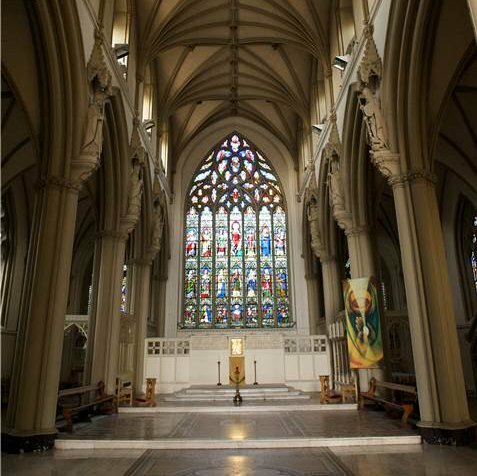 These works, which included the installation of the high altar, the great east window, the choir, and extensive wall paintings were completed in 1855 and the formal opening of the Cathedral of St John the Evangelist took place on 27th September that same year; the Archbishop of Westminster, Cardinal Nicholas Wiseman preached at the inaugural Mass. 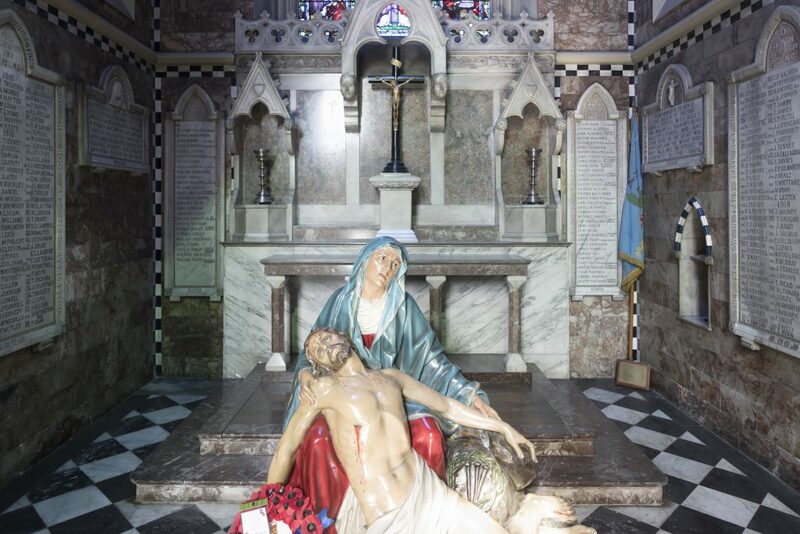 In 1884 the Blessed Sacrament chapel was constructed in the south transept to mark the fortieth anniversary of the laying of the foundation stone. 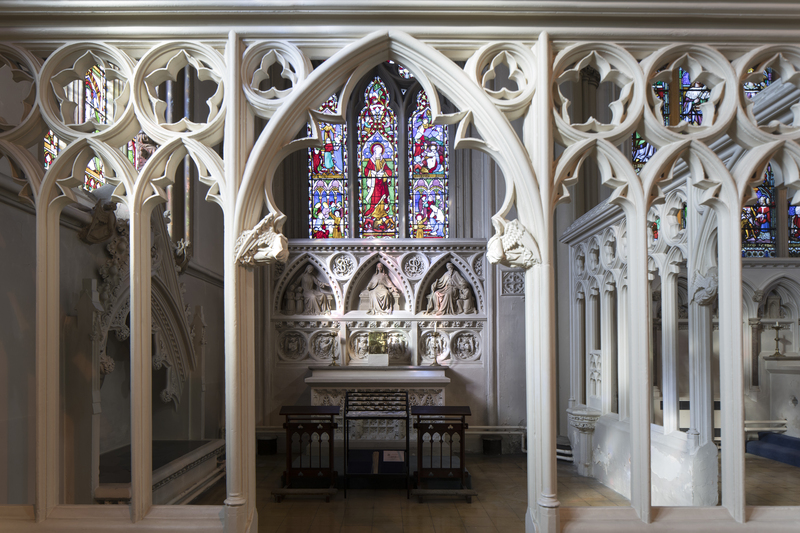 The chapel was designed by Peter Paul Pugin, the elaborate alabaster altar was carved by R. L. Boulton & Sons of Cheltenham, and the decorative panels depicting the Joyful, Sorrowful, and Glorious Mysteries of the Rosary were painted by Joseph Aloysius Pippet. Two years later the Holy Rosary altar was installed in the Blessed Sacrament chapel, this is now located in the north transept. On 14th June 1890 Bishop (later Cardinal) Herbert Vaughan consecrated the Cathedral. On 25th February1923, the WWI Memorial chapel was opened; it commemorates over 600 men from throughout the Diocese who lost their lives during the conflict. 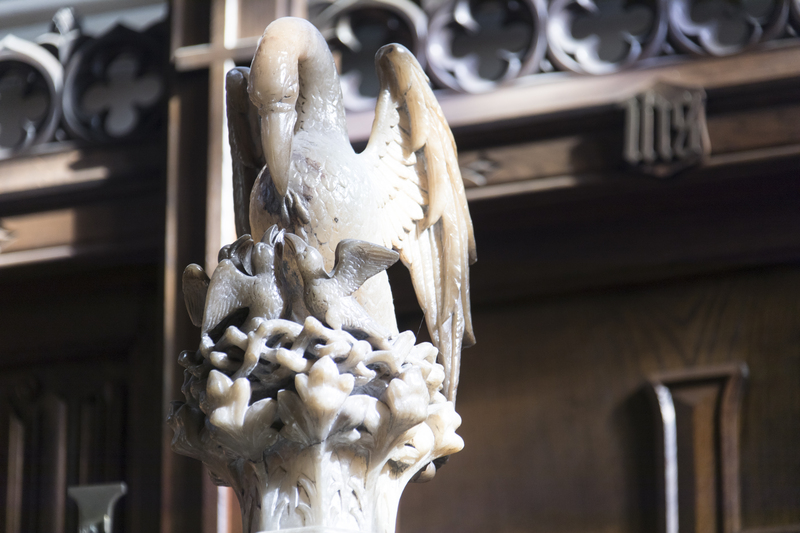 Between 1947-49 the Cathedral underwent restoration following fire damage during WWII. 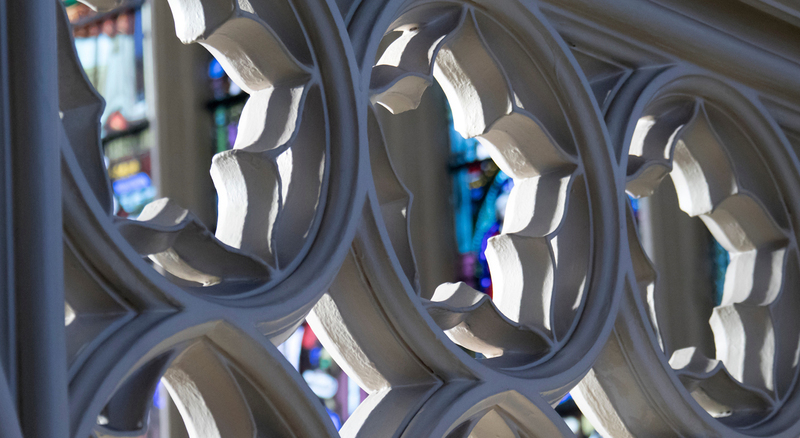 The great east window was restored, all of walls throughout were painted, covering over the original stencilling, the choir floor was repaired and remodelled, and terrazzo paving was fitted throughout. Between 1971-72 the Cathedral was reordered following the liturgical reforms of the Second Vatican Council (1962-65); the architects were Cassidy and Ashton of Manchester and the work included the creation of a new nave sanctuary with a new altar of Bottichino marble. In 1980 the Cathedral was listed Grade II. Between 1985-88 the Cathedral underwent a second reordering. This saw the removal of the original high altar and reredos, the par-close side screens of the choir and the Baptistery, the oak choirstalls, the cathedra canopy, and the pulpit; the relocation of the rood cross, and cathedra; and the installation of the present ambo, Stations of the Cross, and Baptismal font.